Today is the official halfway point for month o’socks. I am evaluating my progress today and trying to get a handle on my goals. While I had extra knitting time this past week, that will end tomorrow. Progress will now slow down majorly. I think it is reasonable to expect to finish Nick’s socks, the Wanida socks, and the Christmas stocking. 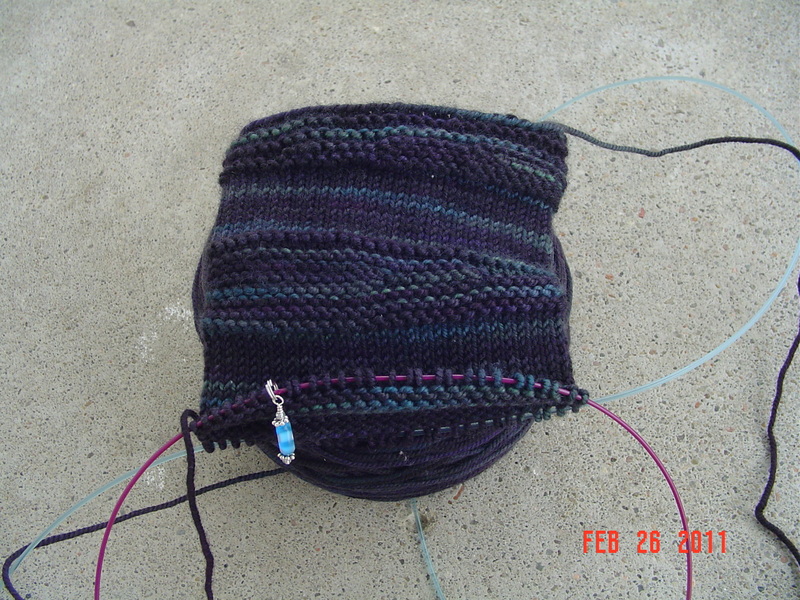 I will then be forced to work on the Lissajous stockings, but it will take a small miracle to actually complete them. Not to mention my avoidance due to the possibility of running out of yarn. It will be interesting to see where I stand at the end of month o’socks. Nicks Wedge socks are coming along swimmingly. I’d like to have them completed and in the mail tomorrow, not sure I can make it, but I’ll try. 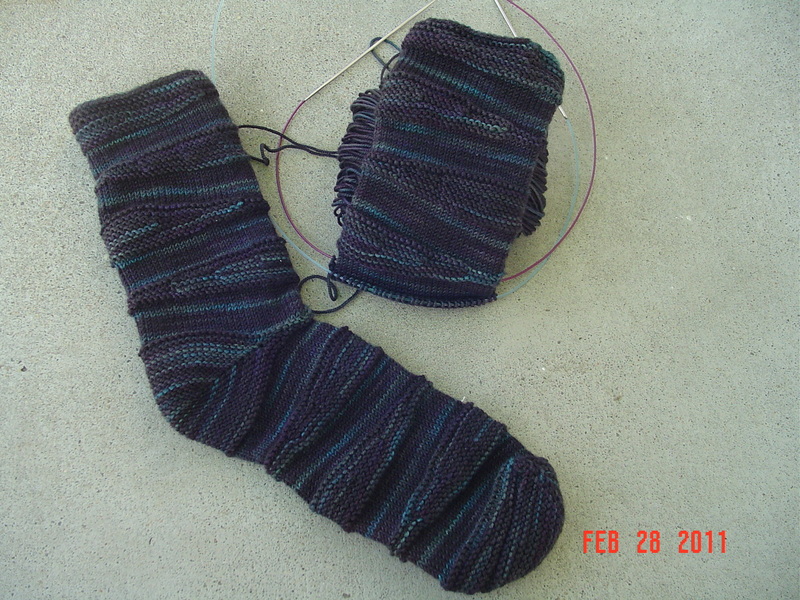 I finished the toe of the first and am about to start the heel of the second. Obviously this is where the bulk of the progress has been made. Meanwhile, though I promised I’d knit a heel flap on the Wanida socks, that didn’t exactly happen. 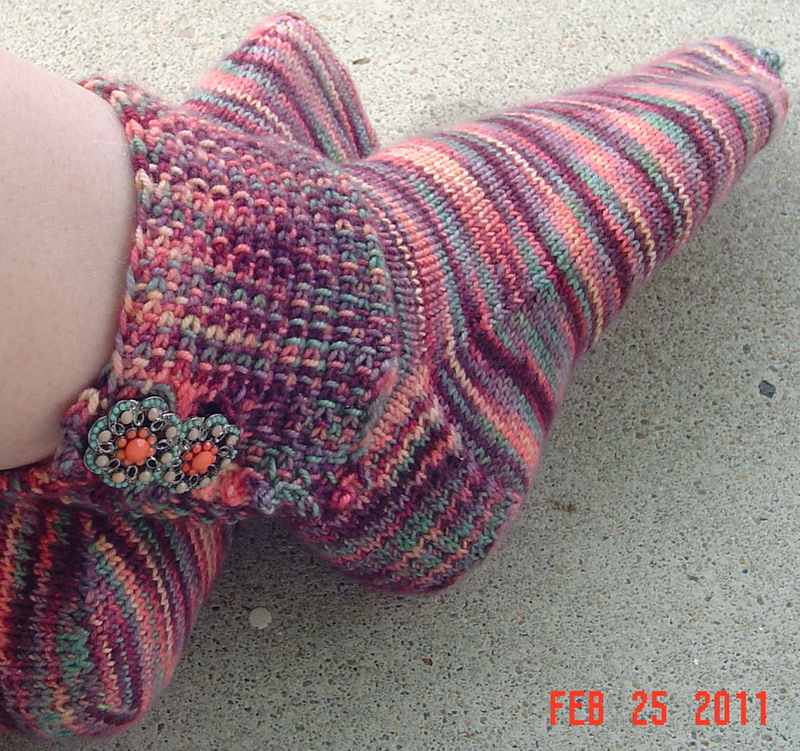 Mostly because I did not have the pattern book with me, and couldn’t figure out the heel flap without it. I thought I could, but I was mistaken. So instead I began the heel flap on the Christmas stocking, but quite frankly, that really is only a few rows long itself. 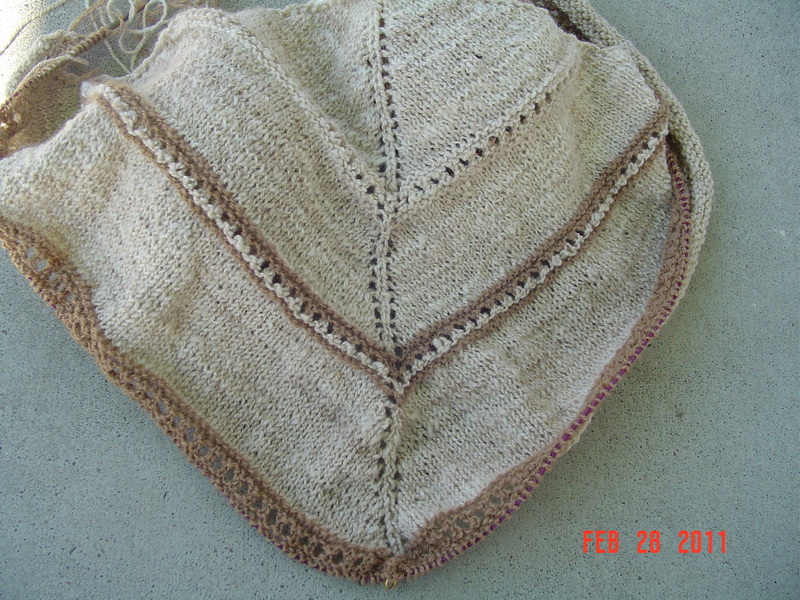 I did make decent progress on the Lillia Hyrna shawl though, managed to get to the second contrast color section. Already the rows are very long, but I think it will be both stunning and rustic once it is complete. OK-back at it, I’ve a wedge sock to complete! A long haul was done on Nick’s socks, but sock #1 not complete yet. Curses to big feet! I am almost at the point where I need to start the toe, which means I need to do a little reconnaissance work, due to the directions confusing me. 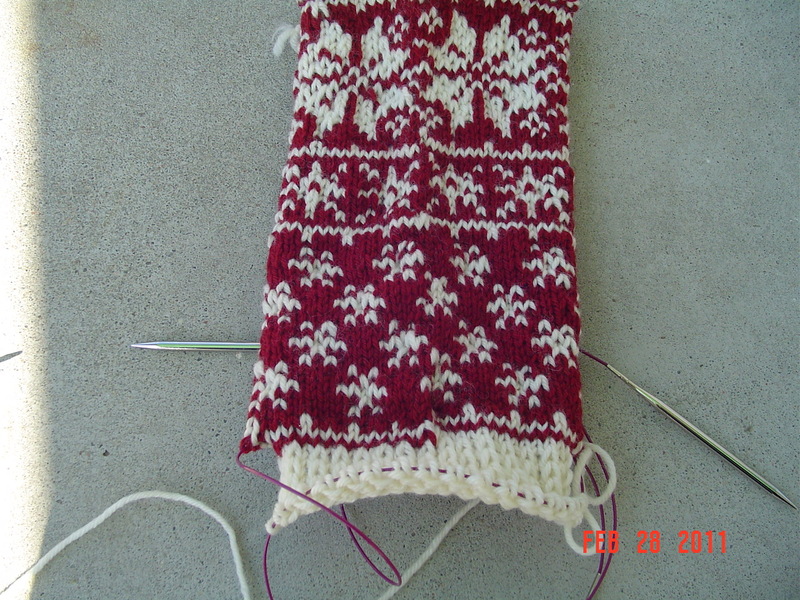 I really hope I am able to figure out the toe instructions since this knit has been so awesome so far. I also REALLY hope they fit! 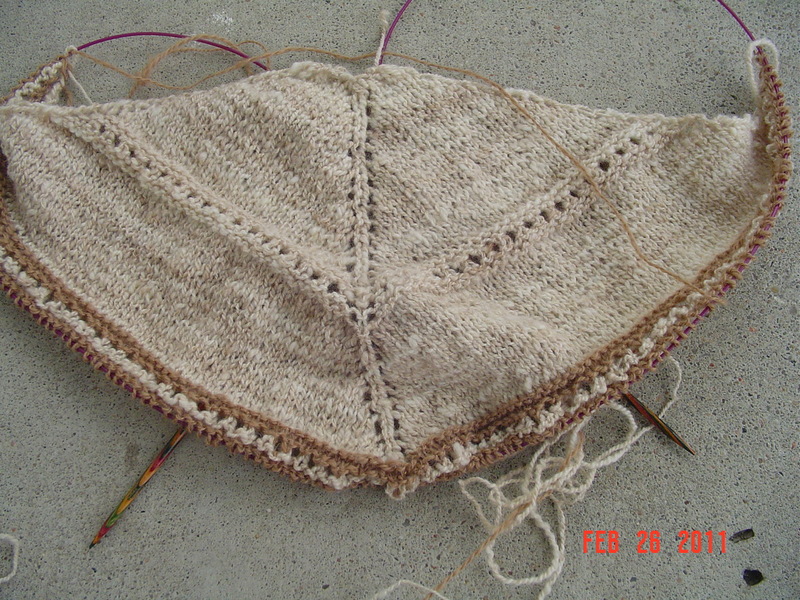 To rest my hands from time to time, I worked on my Lillia Hyrna shawl, a few rows progress, but not much. That is it! I have vowed to work on the heel flap of my wanida socks before the next blog post, let’s hope I can stick to that goal! 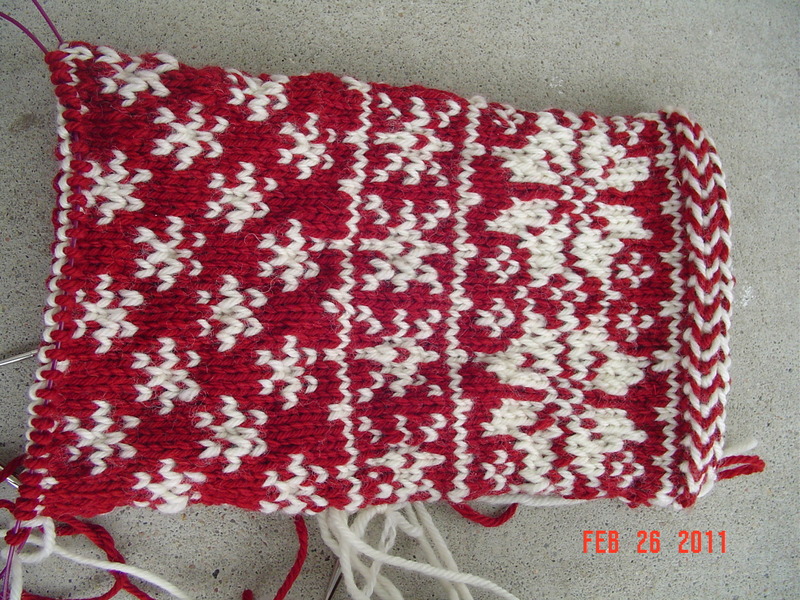 A sixth falling snow stocking, which is quickly becoming the traditional Christmas stocking for new family members. I suspect this is one of two that I will have to knit this year. I also pulled out a project which I have previously kept quiet. I started it quite some time ago, but needed to finish more spinning so I could continue. It is the Lillia Hyrna shawl from Knitters Book of Wool. The lighter color is my handspun alpaca/cormo/silk 2 ply, and the darker color just added is 100% camel handspun 2 ply. I’d say the lighter color is about a sock weight, so I say it counts for month o’socks. 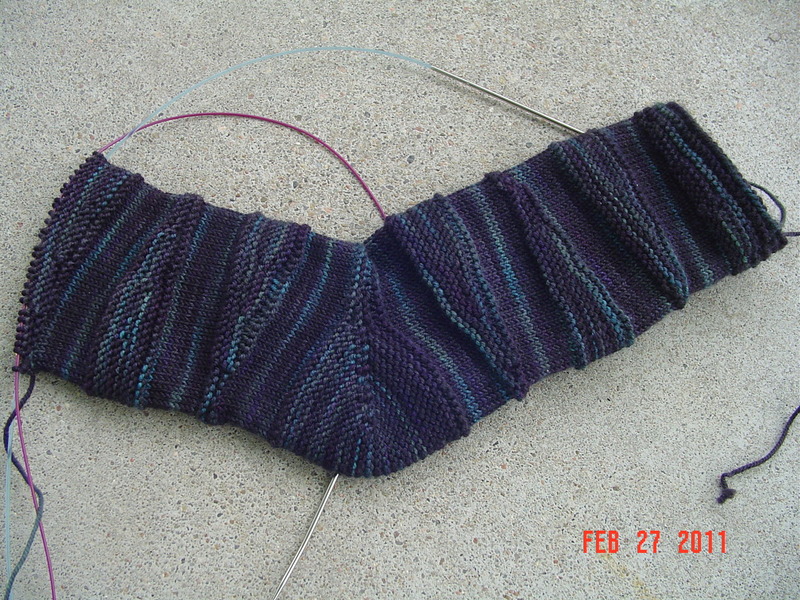 And finally, I did do a bit of work on Nick’s Wedge socks. Which are awesome! The construction thrills me, a very interesting knit. I am saving the rest of the Christmas stocking until my hands ache again. I need to make the heel next. So the wedge socks are the socks of the hour today. A finished object! Finally. My Rock and Weave socks are complete. 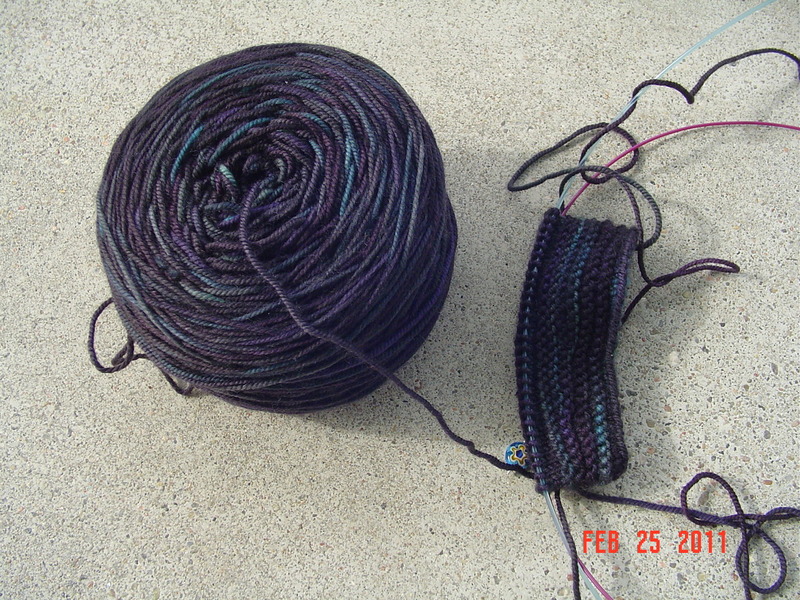 Yarn is blue moon fiber arts socks that rock mediumweight in colorway faulty dyer. I think this is just a most stunning color combination. Now, I must say, if one is going to knit socks that require buttons, one must choose the most whimsical buttons one can find! 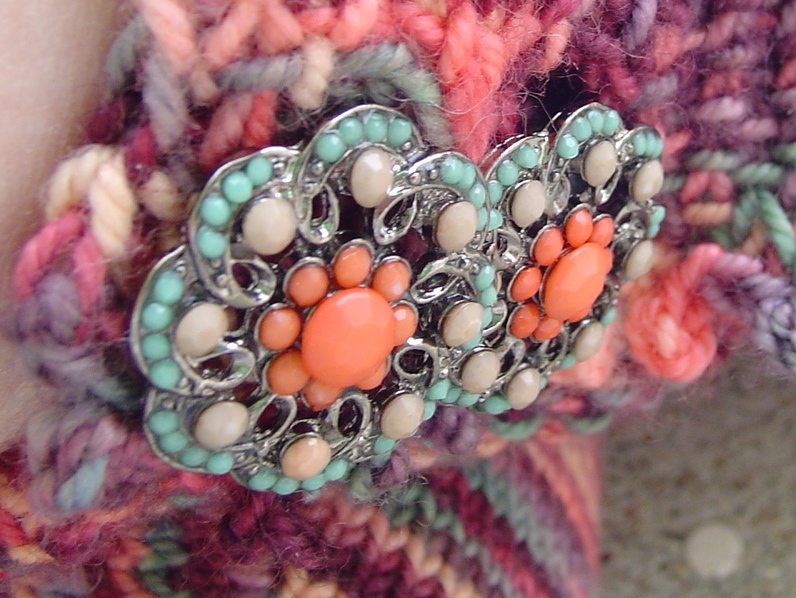 I am really proud of the button choice, I never imagined I’d find buttons that match so many of the color tones so well. The socks fit well and would be a great choice of a summery sock, since they feel light on my feet due to being anklets, and the cuff is not at all tight. After I finished these, I strayed from the plan just a bit. Nick has asked for another pair of socks, and so I came by a skein of Korpii (also BMFA socks that rock mediumweight) and decided to start the wedge socks from Knit. Sock. Love. I’ve had my eye on the interesting short row construction so decided to give it a go. I think they will make fine manly socks. Sadly, my hands have just about had it, and I am going to have to start on the bulky christmas stocking now. 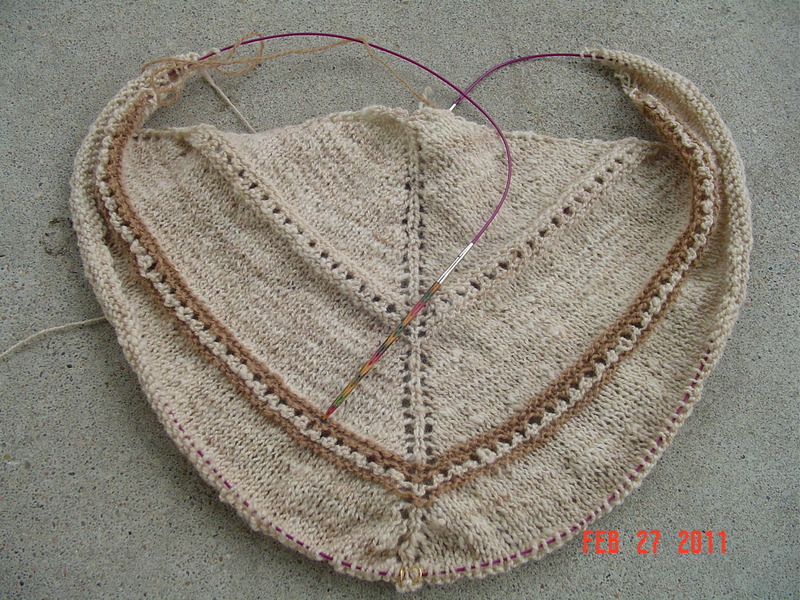 I need to be using needles that are large and yarn that isn’t quite so tight of a knit. So the wedge socks are going to have to take a back seat for a day or so. Only one pic for you today, but don’t worry, tomorrow I’ll be on to another pair again and can show you something new. 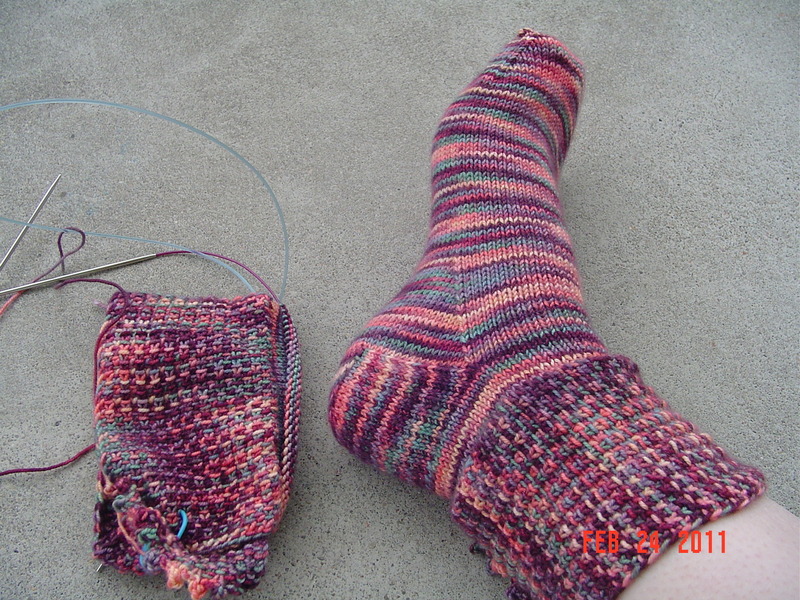 I’ve finished one of the Rock and Weave socks, the second pair needs a heel. I also purchased buttons for them, but I am going to save that little surprise for the FO post. My handspun lacy baktus scarf is complete. 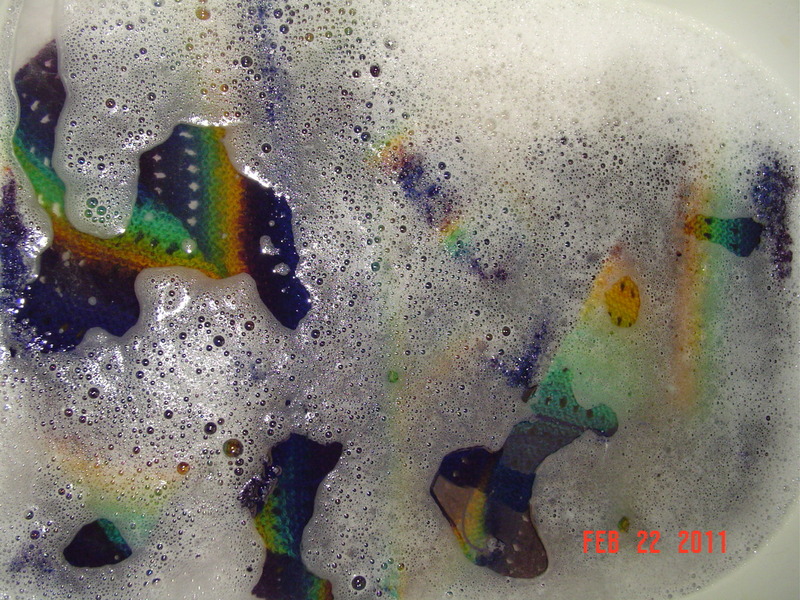 It has all the charm of noro if you ask me, thick areas, thin areas, but the colors are good. Oddly it is also a little “cottony” feeling even though it is merino wool. 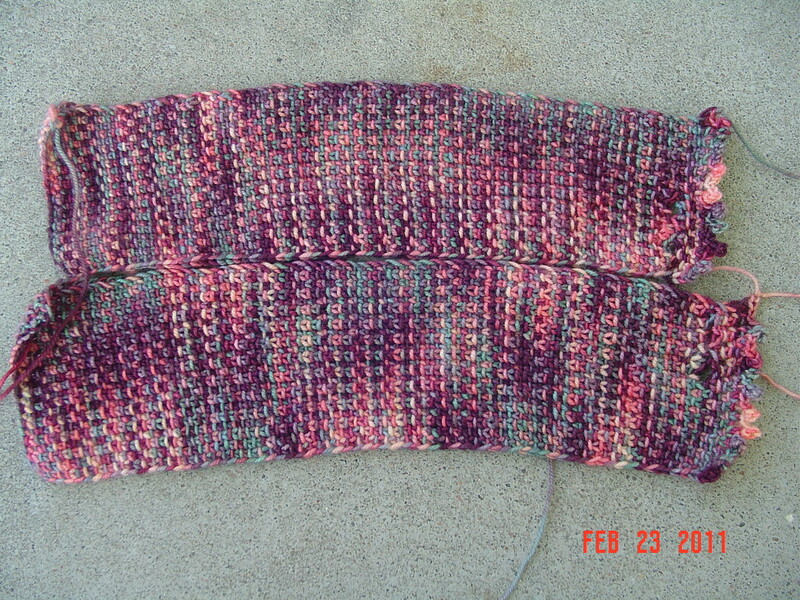 I believe that the wool top originally came from Lorna’s Laces, colorway circus. At 5oz. and then some, it makes for an ample scarf even as a 3 ply yarn. This is my second baktus scarf, but neither are for me. So the color I have on the wheel right now? That one will be all my own. I also began my Rock and Weave socks. I’ve finished both linen stitch cuffs. This is the first time I’ve done linen stitch, and while knitting it, all I could think is that the pattern would make a fantastic scarf. I intend to consider that in the near future. After month o’socks of course! It really is a fantastic stitch pattern for busy hand dyed yarn. I have only one picture for you today. I only worked on one project. Tomorrow there will be a finished object picture.